We’re in our Capital this weekend. 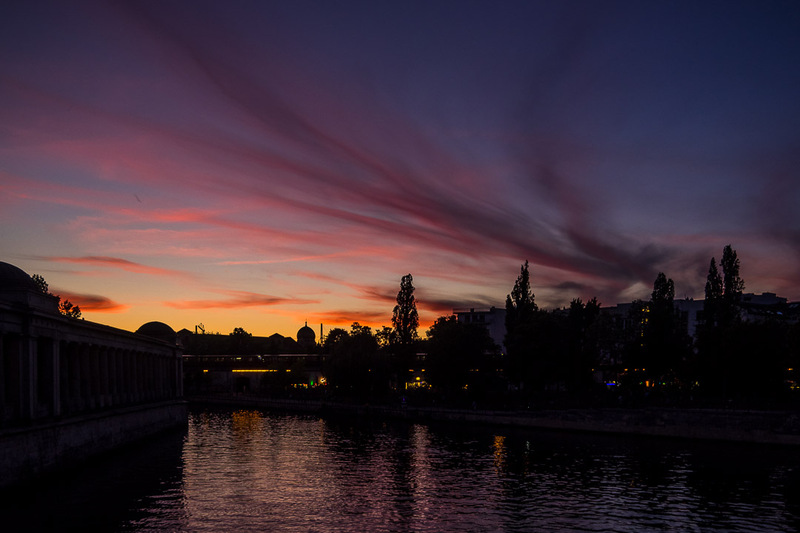 After seeing a marvelous concert in the Berlin Cathedral with music from Karl Jenkins we walked out just in time to see this splendidly colored evening sky behind the Spree river. Image specs are 1/80 sec at f/4,1 and ISO 200,17mm focal length. Camera was the OM-D E-M1 with the mZuiko 14-150mm F/4.0-5.6. Took quite a few photos yesterday, but returning to our room only way past midnight and needing to get up early in the morning to go to the next event I just downloaded my photos, but had to time to go through them. So with this quick sunset snap I wish you a good Friday and a hopefully relaxed start into a blessed and peaceful weekend! Beautiful colors and silhouette, Marcus. Hope all is well! Beautiful photo! Have you visited the Digital Photography School Facebook Page? They area having a sunrise around the world challenge. Take a sunrise photo, submit it, label with when and where it was taken. Pretty shot – you have a great weekend too Marcus! What a beautiful sunset. Enjoy your weekend in Berlin Marcus, hope its warm and sunny like it is here ! Thanks, Marion, and the weekend is going great so far! Summer pure 🙂 ! Indeed it is, Zeno! Thanks for commenting!